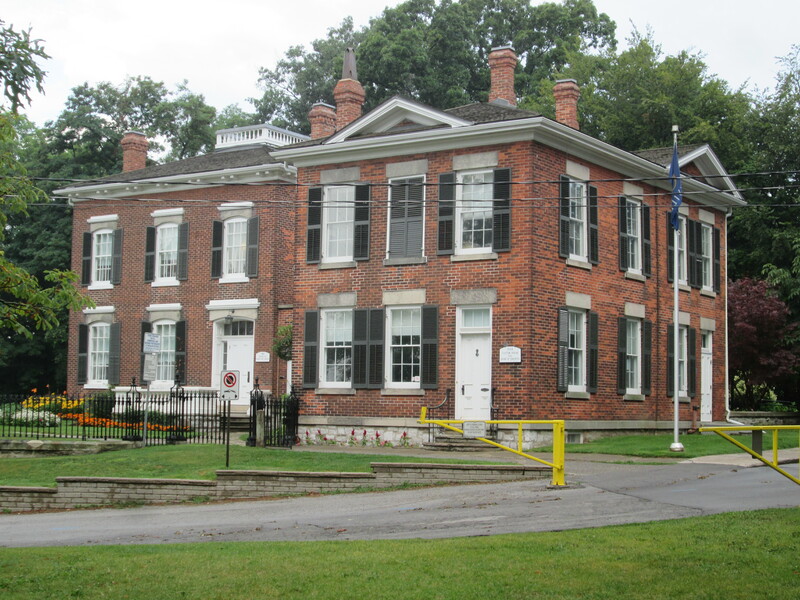 This hike examined some of the early history of Oakville as well as the Kerosene Castle. It was another of those very hot and humid summer days when the morning temperature read 21 but felt like 28. 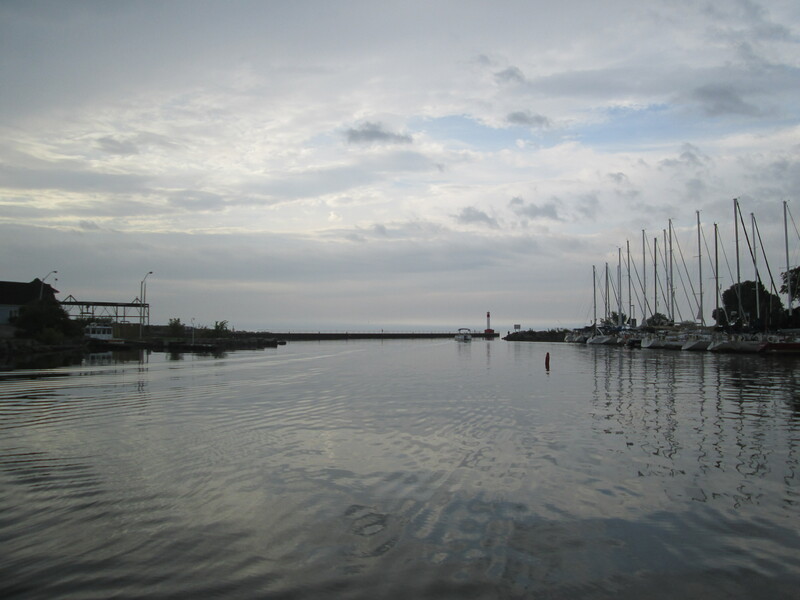 Having parked on the end of King Street we set off to look at the mouth of 16 Mile Creek where it empties into Lake Ontario. The picture below shows the view looking downstream toward the harbour break wall with it’s lighthouse. Note the masts to the many ships that dock in the harbour. William Chisholm was born in Nova Scotia in 1788 and in 1827 he purchased 960 acres of land at the mouth of 16 Mile Creek. William Chisholm’s nickname was White Oak and it is thought that the name Oakville may come from this. 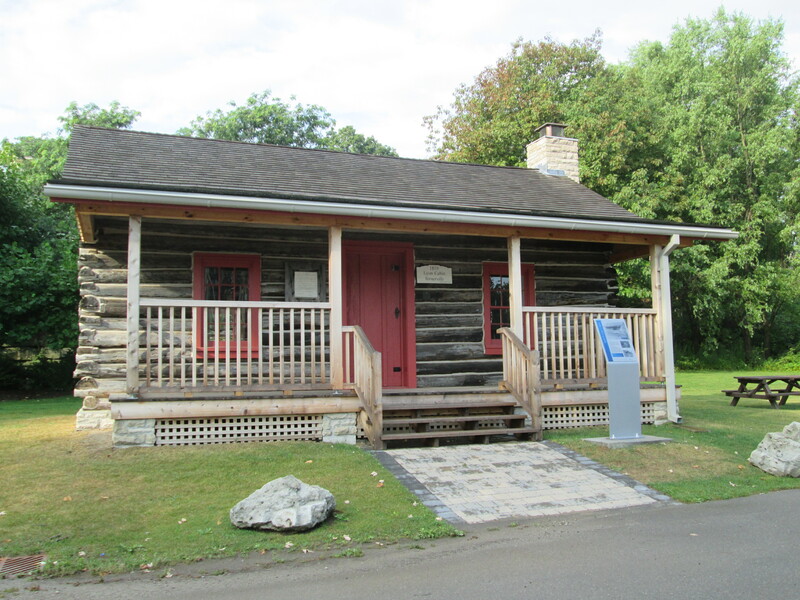 Chisholm quickly established a shipbuilding business and had the first privately owned harbour in Upper Canada. The large supply of white oak trees supported the shipbuilding industry and may also have been the source of the town’s name. In 1834 the harbour was officially recognized as a port of entry for Canada and Chisholm became the first customs inspector. The building on the right in the picture below is the 1856 Customs House and Bank of Toronto Building. The left part of the building is known as Erchless Estate and was home to the Chisholm Family. 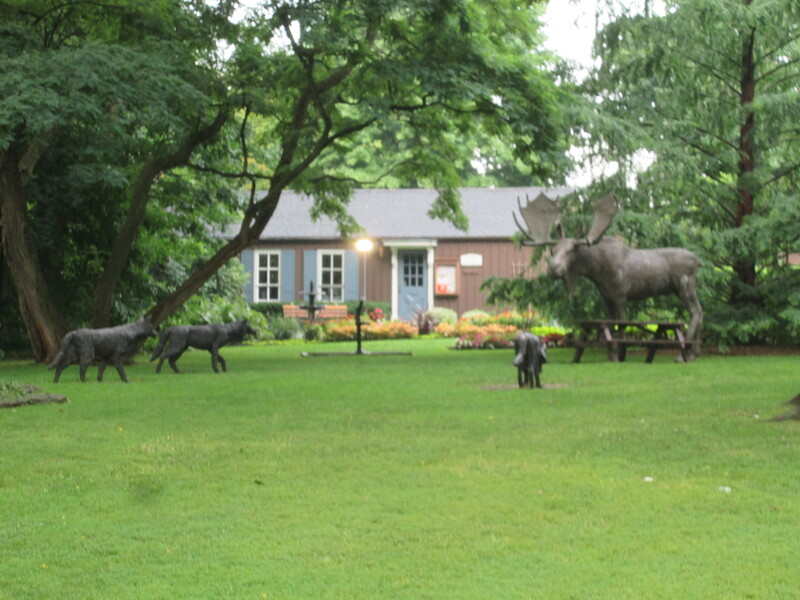 Behind the Customs House is an art exhibit called the Moose and Wolves. It was donated by the people of Neyagawa Japan, which is the sister city to Oakville. This building served as the post office from 1835 until 1856 with William Chisholm as post master. A lower mill stone is being used as a landing at the bottom of the stairs. William died in 1842 and his son Robert Kerr Chisholm became post master and customs inspector. 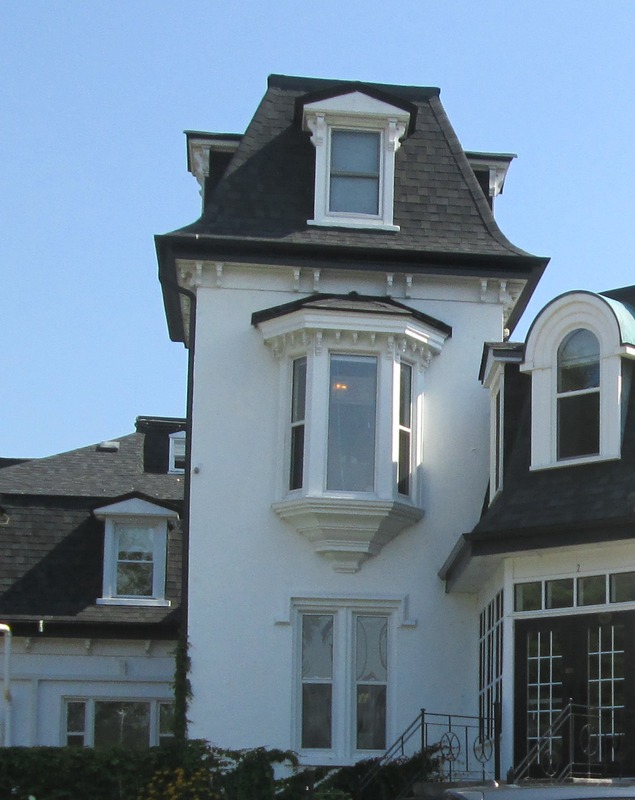 Electric lighting arrived in Oakville in 1892. An old paint factory from 1870 was converted into a generating station. There were 152 street lights in Oakville in the early days running for 7 hours per night at a daily cost of $3.50. The generator experienced ongoing problems and was replaced with power generated in Niagara Falls in 1909. The building was later used as a tea room under the name of The Electric Light Cottage. It currently serves as a private residence. 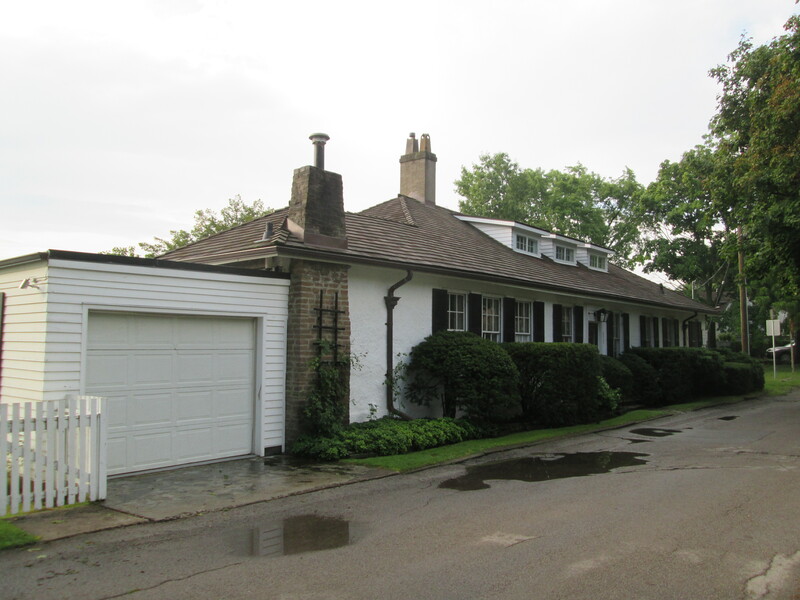 Many of the early homes in Oakville belonged to people in the shipbuilding or sailing business. The smaller homes on Thomas Street from 1852 belonged to Duncan Chisholm, shipbuilder, and were known as the workmen’s houses. 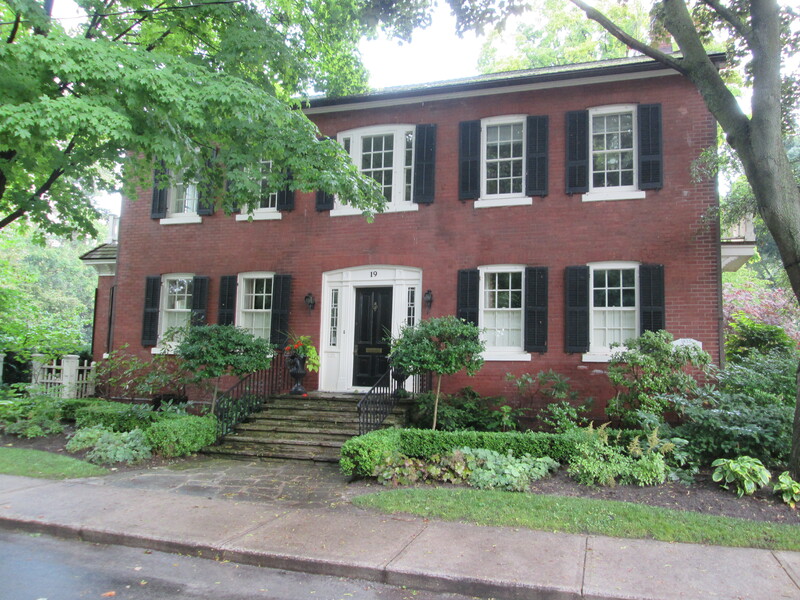 This 5 bay home pictured below was built in 1835 by David Patterson who was also a shipbuilder. He apprenticed in Dublin but moved to Oakville in 1827 to work at the Chisholm Shipyard. In 1857 Patterson was appointed “pathmaster” which meant that he was in charge of the roads. Men had to work an annual amount of statute labour maintaining roads or pay a fee instead. Patterson organized the labour and collected the fees to pay for materials. When he died in 1877 the house was sold and the brick veneer was added to the outside in the early 1880’s. George and Mary Lyon were married in England in 1868 and sailed for Canada that same summer. 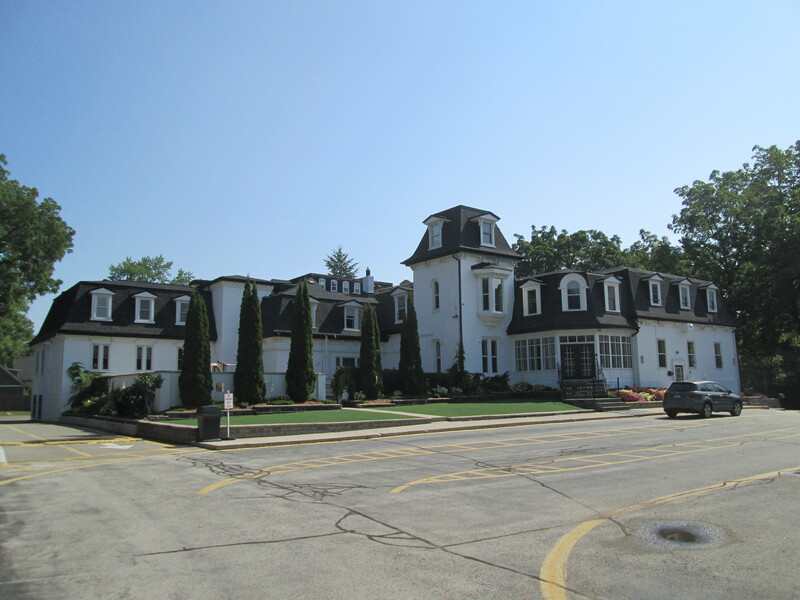 They bought 50 acres of land on Trafalgar Road near the Oakville Townhall. 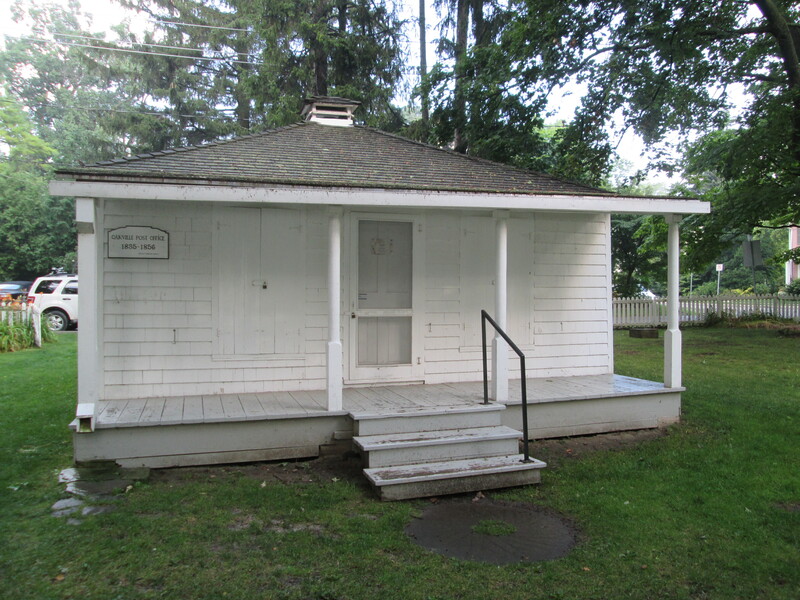 This cabin dates to about 1810 and was already standing on the property. George added a lean-to for his buggy and 9 children to the tiny home. 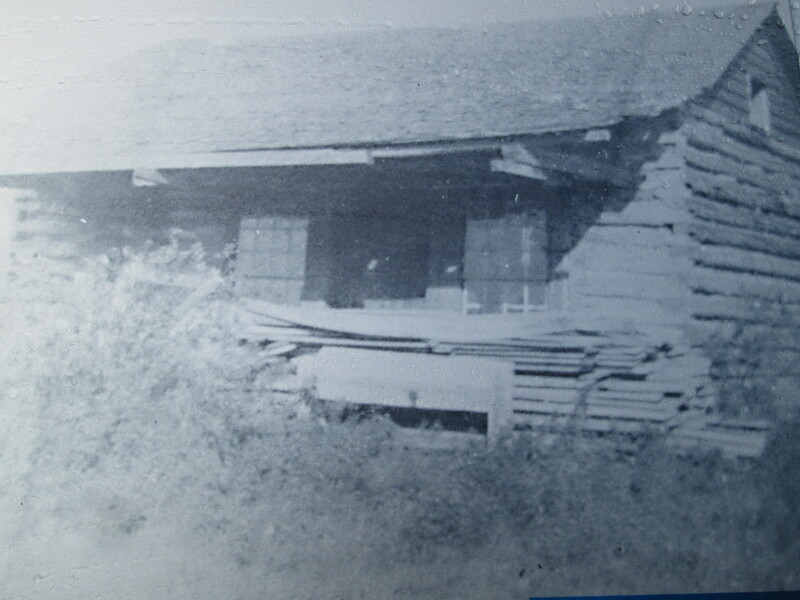 This is the home as it looked in 1973 when construction workers found it while clearing the property for new development. 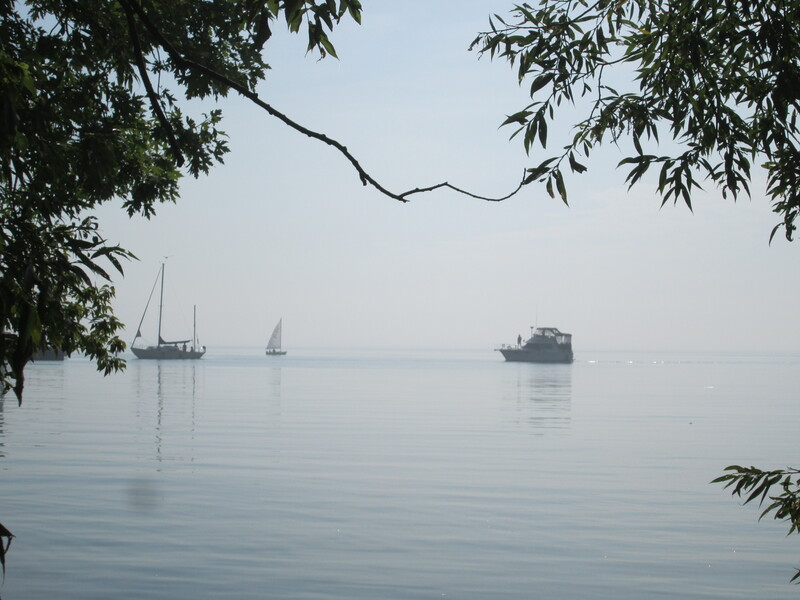 We sat for a few minutes on the rocks along the side of Lake Ontario in Lakeside Park and enjoyed the morning activity on the lake. A swim club was doing laps around a floating marker and boats were coming and going through the mouth of 16 Mile Creek. Along with canoes and kayaks there was also one guy on a stand up paddleboard. We moved the car to Inglehardt street so that we could investigate the Kerosene Castle as well as look for evidence of the Oakville Oil Refinery. Richard Shaw Wood built a coal oil refinery on the side of 16 Mile Creek to convert coal to kerosene. It quickly became one of the largest kerosene refineries in Canada. Kerosene had been around for centuries but burned with a black smoke that made it useless for interior lighting. In 1846 a Canadian named Abraham Gesner perfected a method of distilling it into a clear liquid that would burn cleanly. In 1856 Wood built a mansion across the street from the refinery. 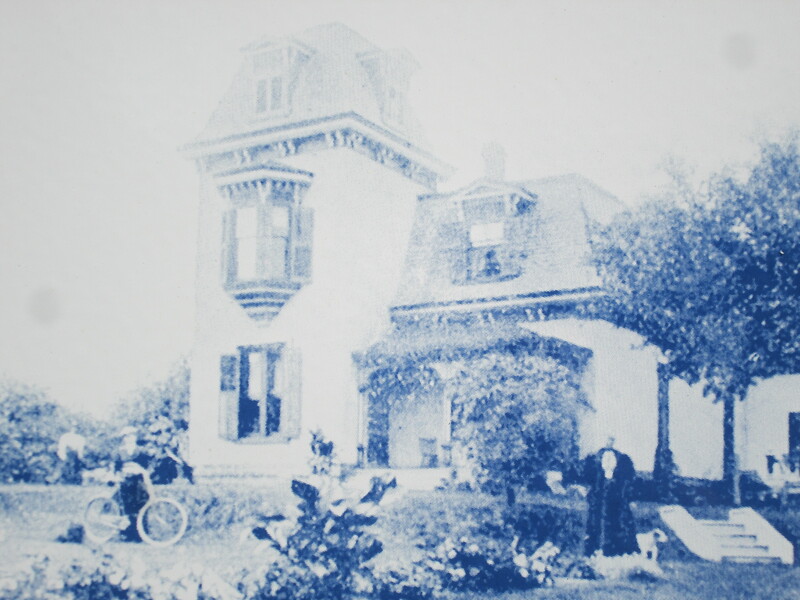 The mansion would take on the name of the Kerosene Castle and would serve as a family residence until the mid 1900’s. The house was then divided into a nursing home on one side and apartments on the other. In 1978 it was converted into MacLachlan College. When I was reviewing the pictures I took I found that one of the eight that featured the tower has what appears to be a face covering the entire centre window on the front of the tower. This is especially creepy when blown up a bit. Another picture taken seconds later from a slightly different angle shows nothing abnormal. This window is known as an oriel window and along with the tower was the main reason for the property to gain an historical designation. On July 13, 1866 the refinery burned down, likely as a result of a faulty new still that had just been installed. Burning oil floated on 16 Mile Creek and lit the water up all the way to the harbour. Oil seeped out of the ground for more than a century afterward. We were unable to access the creek area where the refinery stood as it has been redeveloped for private housing. The picture below shows the Kerosene Castle around 1890. We found the neck of a clay jug on the creek embankment. This jug was known as a blue flowered jug and was produced by Nicholas Eberhardt. Eberhardt came to Canada in 1860 from France. Between 1863 and 1865 he worked for Toronto’s Don Bridge Pottery. After 1865 he operated his own pottery making business. 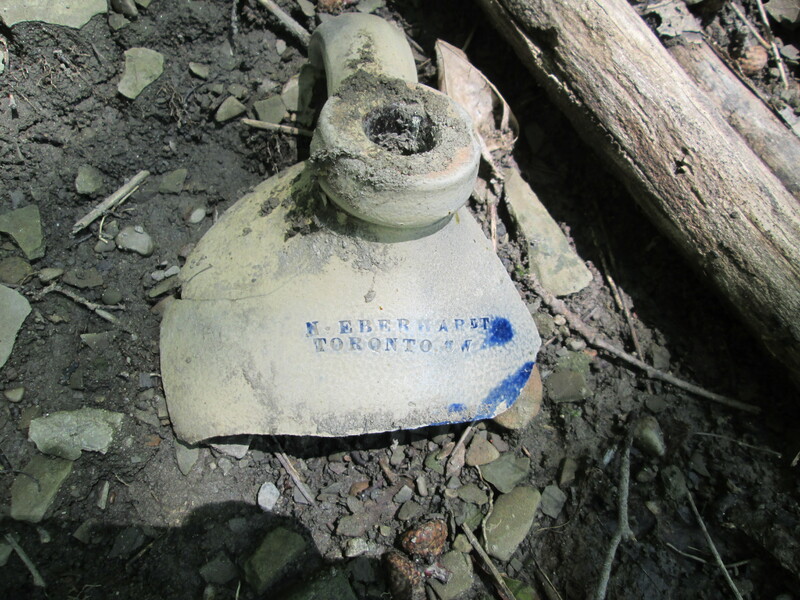 The fragment we found contains the markings N Eberhardt, Toronto CW. The CW is interesting because it identifies the jug with Canada West, a title used for the area of Ontario between 1841 and 1867. Following 1867, and Confederation, the name was changed to Ontario. This jug was therefore manufactured between 1865 and 1867. Richard Shaw Wood operated the Oakville Oil Refinery on the side of 16 Mile Creek across the road from the Kerosene Castle. 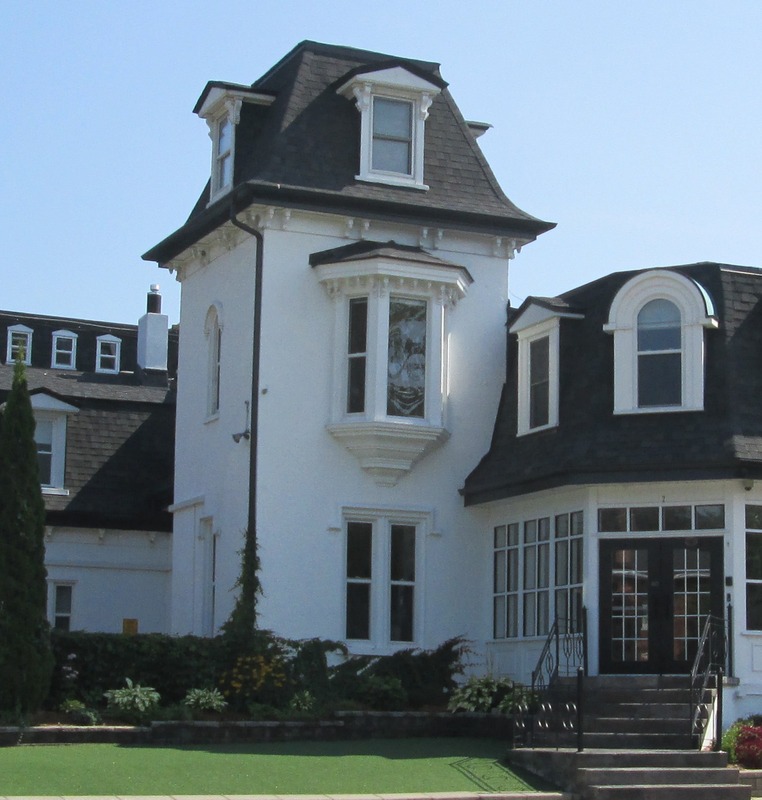 Although it was destroyed and not rebuilt it was not the end of the oil industry in Oakville. Just east of here along the Lakeshore is the Suncor Refinery. Two other refineries along the lake shore have been closed in recent decades. Why not enjoy a summer hike in one of the top 15 places as selected in this special edition. 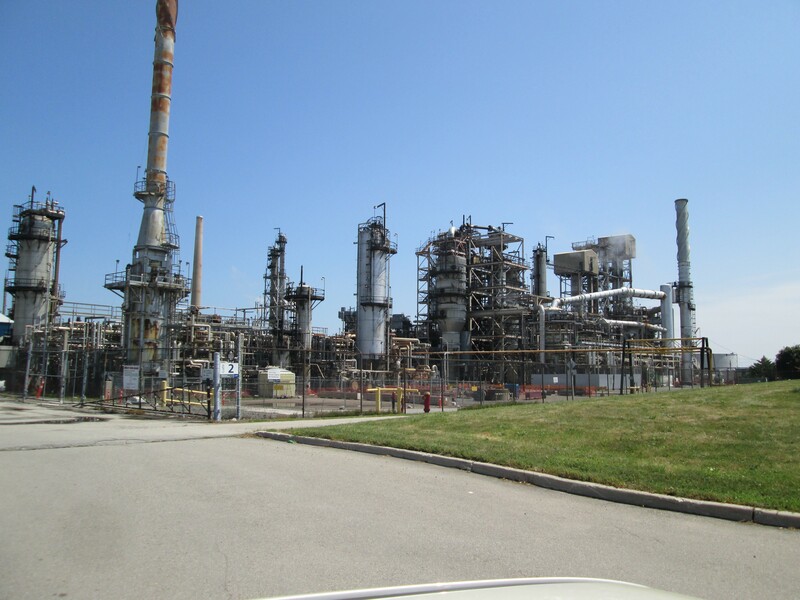 This entry was posted in Sixteen Mile Creek and tagged 16 Mile Creek, Kerosene Castle, N Eberhardt Toronto, Oakville, Oakville Oil Refinery, pathmaster on August 18, 2015 by hikingthegta. Nice work but some factual errors. William Chisholm did not emigrate from Scotland. He was born in Shelburne (actually Jordan Harbour) Nova Scotia in 1788. You should really cite your sources in order to give them some publicity and credit their research. Thank you George. I had in my notes that he was born in Nova Scotia to Loyalist parents. I appreciate the opportunity to improve the article. The 1881-1882 Pharmaceutical Journal lists Charles W. Pearce as a pharmacist in Oakville.